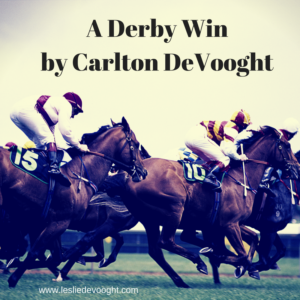 Last spring, I told my husband, Carlton, about a flash fiction writing contest that wanted stories about sports and romance, and he wrote this fun piece about the Kentucky Derby. Then he endured my brutal edits, and we’re still happily married, but we won’t do that again. This Saturday is Derby Day, so I thought it was the right time to share it. I know you’re going to love it. What a miserable day. As rays from the setting sun, pushed through the clouds, Clint raked his fingers through his wet hair, surveying the damage. The torrential rain shower had drenched his new seersucker suit, leaving it transparent. His pink shirt shown through the white stripes in his jacket, making it look like someone had sloshed raspberry lemonade on him. Mud from the infield and a variety of spilled drinks had turned his once white Bucks into a Jackson Pollack work. The pathetic lemon bow tie dangled around his neck, warped by the hours of rainfall—Sinatra’s disdain was palpable. With his shoulders hunched over and arms hanging limp, he began his walk of shame, his damaged sartorial goods were just the start. Lori Anne had gushed over his invitation to join him at the Derby in his sought-after seats on the final turn. Her lack of depth reared itself when she abandoned him to join some celebrity’s posse in a box on the stretch. All he had left was the stack of plastic mint julep cups, commemorating the 143rd running of the roses—a pitiful trophy. Under the shadow of the Churchill Downs’ Spires, he attempted to scan the crowd for his group. Instead he experienced a solar eclipse brought on by a gigantic emerald green hat covered in a cacophony of red roses and white feathers. The feathers swatting his nose tore the cap of politeness off, spewing his frustration and spiking his blood pressure. The head under the hat snapped around. Her fiery eyes scorched everything in their path, searching for the offending party. He straightened as her eyes bore down on him. His heart beat like the hooves of the racehorses. But he couldn’t pull his eyes away from her. The millinery framed long red curls and alabaster skin—an enchanting fury. Ouch. Harsh honesty that he deserved, but it still stung. Dropping her gaze to his feet, she grimaced. “And what color Bucks are those?” She was leading down the stretch, giving a final glower to push her over the finish line. “Certainly not white.” She smirked, daring him to respond. She tilted her head to the side, pursing her lips. Through narrowed eyes, she studied him. His mea culpa had either touched a suppressed nerve of empathy or simply confused her. “Humility is not something I often find in Kentucky men.” Was that a hint of pity in her jade eyes? At this point, he’d take it. “Apparently, my horse didn’t like the mud.” He showed her his losing ticket from the betting window. She tapped the ticket. “That’s ’cause you bet on the seventeen horse, and no horse has ever won from that slot. If you don’t have a horse running, best odds are on five or ten.” She tilted her head, blocking the sun with her green headgear of sinamay and feathers. “Or you could pick the horse wearing the prettiest silks like I did.” She winked—a font of Derby knowledge. She tossed him a smile. Despite his damp hand, she clasped it, firm and steady. “Mary-Brighton.” This was not a normal filly. She was special, and not afraid to race with the colts. “Don’t suppose you’d like to get out of here and have a drink with me.” He tried his lopsided grin. She nodded towards his trophy. “As long as it doesn’t include bourbon.” She hooked her hand around his arm. A winning day after all and his odds were looking better for post time at the Preakness. Well done, Carlton. Quite descriptive. Ah – just a couple of writers encouraging one another. Love it! And – so good to see y’all today. Such a joy to see Libby continuing to grow into a beautiful young woman – inside and out. God bless each of you.